Fed up of inefficient time planners? Make planning fun with a fluid, easy-to-use interface. Feel organized with TimeLinr - The Best Time Planner. A fun lightweight planning app that ensures you always know what to work on. Become a planning demigod now. Ditch paper lists. Buy your TimeLinr Personal Plan today! Let's Take A Look At The Demo Of TimeLinr! A Sneak-Peek Inside TimeLinr - The Best Time Planner App! Why Choose TimeLinr - The Best Time Planner App? the granular card-based view you know and love. 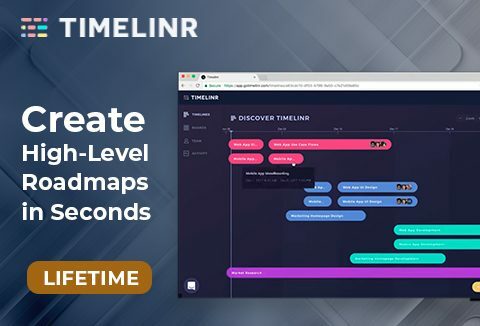 Timelinr is designed to be the most fun you'll ever have planning, with an innovative interface and collaboration features that keep everyone up to date in real time. Fluid timeline planning interface that allows you to see everything. Kanban boards that link to your timeline so you can plan any way you like. Simultaneous Collaboration lets you see your team's updates in real-time and communicate around tasks. Keep track of your projects at a high-level with sort bars by priority & team. Break things down with To-Dos and seamlessly link cards & bars. Switch between Light and Dark theme modes whenever you like. Collaborate Faster by sharing your timelines with teammates. No more wondering if your change is going to be missed. Everything you need to manage your project all in the cloud which means no more messy/missing papers. Mark H. - People definitely need to get on this. I know this app will hockey stick in no time because the other products on the market (like ProductPlan) charge a lot and definitely do not have the fluidity of Timelinr! Lorraine M. - Just purchased - what an impressive interface. I'm a visual person and this is awesome! It's also super easy to set up. Just a few minutes and I have a timeline set up for my latest web development project. You can choose lifetime access to the single user "Solo" account, or the 3 or 5 user versions of the "Personal" plan. Access does not include any guarantees about service availability or uptime. Now create effective high-level roadmaps in seconds, that ensure your stakeholders, team, and clients know what exactly is going on. At A Deal Price Starting From $29 Only!